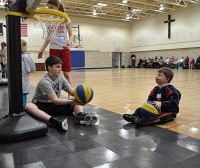 Created in 2009, iCANhoop basketball brings athletes ages 5-19 with cognitive and physical disabilities together with typical kids for a basketball experience neither child will ever forget! and of course, everyone’s favorite; Shooting! while learning teamwork and developing new skills! 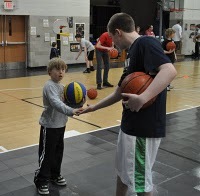 1:30 pm – 2:30 pm (Athletes ages 3-10 years old) -basic skills from dribbling, passing, ball handling and shooting. 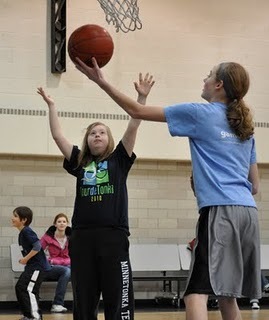 2:45 pm – 3:45 pm- (Athletes ages 11-21 years old)- basic skills from dribbling, passing, ball handling and shooting. Advancing to 2 x 2 play. * If you feel your child’s skill level is better in a different age group, please contact Tonya and we can discuss switching groups. We want your athlete to get the most out of the experience! Registration Fee: $50.00 Includes T-shirt, Basketball and awards. Parents please note that this is a volunteer organization and the coaches and volunteers may need assistance with your athlete from time to time. Directions: Take HWY 5 west from 494. Once you pass Chanhassen take a left on Galpin Blvd. The Rec Center is on the southeast side of 5 and Galpin next to the elementary school. Buddies can also register on-line and their time will count as community service hours. Please bring forms that need to be filled out for community service hours and we will make sure we sign them at the session. You can sign up for 1 session or if you have the time to help out sign up for both sessions. Any questions? contact Melissa Butenschoen at melissab0414@yahoo.com. Sign up HERE to be a buddy.